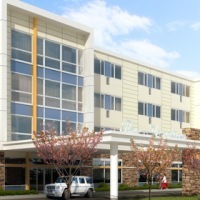 The Venetian is a four-story, 84,000 square foot nursing home in South Amboy, NJ. Arris Engineering Group, Ltd. completed the mechanical, electrical and plumbing systems design for this project. Included on the first floor of the building is a large commercial kitchen, dining area, physical therapy gymnasium, laundry area, reception area, lounge and administrative offices. The second floor maintains acute care patient rooms with lounge and common spaces, nurse stations and storage locations. The third and fourth floors are long term patient care rooms that include single and two bedroom units with common nurse stations and lounge areas. The electrical system includes an emergency generator set that provide complete back-up power to the facility in the case of a power outage. The mechanical systems include central heat recovery ventilation systems for each wing and split system heat pumps employing Variable Refrigerant Flow technology for groups of rooms and spaces. The plumbing systems include standard sanitary, vent and domestic water supply in addition to high temperature janitorial wash basins. A complete medical gas system for Vacuum, Oxygen and Medical Air is supplied through a central tank room located on the first floor. Arris was responsible for all utility coordination and is performing a full range of Construction Administration support for the project that includes but is not limited to, shop drawing review, responding to RFI’s, attendance at project construction meetings, supervision of commissioning services, punchlist inspections and project close-out.